The USGA and R&A have streamlined the rules for 2019 and beyond. There are many changes and it is important that you take the time to read through the rules and begin using them in your casual play. This will help you avoid possible penalties once our tournament season begins. Click here USGA 2019 RULES CHANGES to view the major rules changes for 2019. There are approximately 30 videos and illustrations covering the most signiciant changes. You can also download a PDF file of the complete rules from the USGA website, or access them by clicking here Complete Rules for 2019. Expert Golf also has a video outlining the 20 Most Important Rules Changes. < Click Link. They also sell quick reference rules books for on course use. It is important to understand that this is a competitive tour, and the Tour expects all players to not only play by the rules, but also to enforce the rules. Each player is responsible to protect the field. Infractions may result in stroke assessments, disqualification, or suspension from the Tour. Consult the USGA website for more complete explanation of the rules. PLEASE AVOID SLOW PLAY: With our large field, it is critical that you keep pace with the group ahead of you. All of the courses should be played in no more than 4 hours & 30 minutes. Agree beforehand that your group will play ready golf. Take a few clubs, walk to your ball, and be ready to play. Also, take note that your search time is now limited to 3 minutes. For complete information on rules, visit the USGA Website. THE FOLLOWING IS A HYBRID VERSION OF THE NEW USGA RULES FALLING BETWEEN THE PLAYER'S EDITION AND THE FULL RULES. Play the course as you find it, and play the ball as it lies unless exception is provided by another USGA Rule or local rule established by the committee. RVSGT Local Rule - You may lift, clean, and place your ball within one club length in your own fairway. Play by the Rules, and in the spirit of the game, by exhibiting integrity and showing consideration for the course and other players. If you breach a Rule, you are responsible notify your opponents and apply your own penalties so that you cannot gain any potential advantage over your opponents. A penalty applies when a breach of a Rule results from a player’s own actions, or those of another person taking action at the players request (see Rule 10). A penalty also applies when a player sees another person about to take an action concerning the player’s own ball or equipment that he knows would breach the Rules if taken by the player and he does not take reasonable steps to object or stop it from happening. One-Stroke Penalty - This penalty applies under certain Rules where either (a) the potential advantage from a breach is minor, or (b) a player takes penalty relief by playing a ball from a different place than where the original ball lies. General Penalty - (Two-Stroke Penalty). This penalty applies for a breach of most Rules, where the potential advantage is more significant than where only one penalty stroke applies. Disqualification - A player may be disqualified from the competition for certain actions or Rules breaches involving serious misconduct, or where the potential advantage is too significant for the player’s score to be considered valid. Introduces the five defined areas of the course, and the importance of knowing the area of the course where the ball lies, and the status of any interfering objects and conditions which often affect the player’s options for playing the ball or taking relief. Course boundaries (usually white stakes or fences), or any area outside of those boundaries, are not considered part of the course. The General Area - Covers the entire course except for the four specific areas of the course described in Rule 2, including every type of ground and growing or attached objects found in that area, such as fairway, rough and trees. It covers most of the course and is where a player’s ball will most often be played until the ball reaches the putting green. A ball is always treated as lying in only one area of the course. Abnormal course conditions, which are animal holes, ground under repair, immovable obstructions and temporary water (Rule 16). No Play Zones as defined by the committee or the course. There is no free relief from course boundary markers, boundary objects (including objects outside the boundary), or integral objects of the course that interfere with play. Covers the key elements of Roanoke Valley Senior Golf Tour competitions. The Overall Winner is the player completing the tournament round with the fewest number of strokes after handicap is applied. A tie-breaker is used for all net awards, as follows: last nine holes, last six holes, last three holes, 18th hole, #1, #2 , etc.... with prorata handicap applied. Low Gross Tournament Medalist is the player completing the tournament round with the fewest number of strokes. A tie-breaker is used, as described above, using gross score per hole with no handicap applied. Scores for each player in a group will be recorded by the Marker (1st player listed on card ) on the official tournament scorecard. At the conclusion of the round, each player must initial the official scorecard attesting to the accuracy of their hole-by-hole scores; therefore, it is strongly suggested that each player keep track of their own scores to reconcile with the Marker. RVSGT Local Rule - Maximum score to be taken on each hole is Triple Bogey. Pick up and move on to improve pace of play..
Official Handicaps to be applied for each RVSGT competition are those shown on the Tournament Scoreboard. Failure to Hole Out will result in a score of Triple Bogey (max score by local rule) for the hole in play. Players have the option of not holing out when it is likely they will score a triple bogey, or higher, for the the purpose of speeding up play. Failure to complete the tournament round precludes players from winning score based Tour awards. These players will receive last place points for the tournament. Covers the equipment that players may use during a round based on the principle that golf is a challenging game in which success should depend on the player’s judgment, skills and abilities. Must use USGA Conforming Clubs and Balls. 48" max length; putters are the only double-faced clubs permitted; face of club must not be modified from original conforming condition except in the normal course of play. Player must not make a stroke with a club whose playing characteristics have been changed during the round. X-Out and Practice ball versions of conforming ball brands may be used during competition. Generic range balls are not permitted. Breach is Disqualification. Note - players are strongly encouraged to place a unique mark on their ball for easy identification. Limited to carry no more than 14 clubs, and normally must not replace damaged or lost clubs. May attempt to repair club damaged during play if retaining the original grip, shaft and clubhead. Breach carries the General Penalty of 2 strokes applied per hole, with a 4 stroke maximum; or Disqualification if iqnored once discovered. Restricted in the use of other equipment that gives artificial help to play. No golf training aids may be used during competiton. GPS devices may be used for distance measurements only. Slope measurement capability must be deactivated. Breach is General Penalty of 2 strokes applied per hole, with a 4 stroke maximum; or Disqualification if iqnored once discovered. For detailed requirements on conforming clubs, balls and other equipment see the Equipment Rules on the USGA website. Covers how to play a tournament round – such as where and when a player may practice on the course before or during a round, when a round starts and ends, and what happens when play has to stop or resume. Players are expected to start each round on time, and play continuously at a prompt pace until the round is completed. When it is a player’s turn to play, it is recommended that you make the stroke in no more than 40 seconds, and usually more quickly than that. The Round - Tournament rounds are 18 holes, usually played from "senior" tees designated by the committee. Some tournaments may use a special designated set of combination tees to achieve an appropriate course difficulty. A player is playing his round from when it starts until it ends, except while play is stopped by the committee. When a Rule refers to actions taken “during a round,” that does not include while play is stopped under Rule 5 unless the Rule says otherwise. Practicing on Course Before Rounds is prohibited on the day of the tournament, except that you may practice putting or chipping on or near your first teeing area and any desingated practice area. Breach is General Penalty. Second breach is DQ. Starting and Ending the Round - The starting time set by the Committee is treated as an exact time. If the starting time is delayed for any reason (such as weather, or by decision of the committee), there is no breach of this Rule as long as the player is present and ready to play when the player’s group is told to start. Players arriving at their starting point after the group has already left the teeing area receive the General Penalty applied to that hole. The round is completed when the player holes out at the final hole. Playing Groups are established by the committee and all players must remain with their assigned groups for the duration of play. Practicing during Round or While Play is Stopped is prohibited. This does not include practice swings or knocking a ball back to player as a courtesy. Players may practice putting or chipping on the teeing area of their next hole, provided they do not delay play. RVSGT Local Rule - Practice putting or chipping on the green just completed is prohibited. Breach is General Penalty - 2 strokes. Suspension of Play - The committe or the course management may stop play for any reason, but usually it will be due to dangerous weather conditions. Players should mark the position of their ball until play is resumed, then replace the ball on it's original spot. Covers how to play a hole – such as the specific Rules for teeing off to start a hole, the requirement to use the same ball for an entire hole, except when substitution is allowed, the order of play, and completing a hole. Starting Play of a Hole - A player has started a hole when he makes a stroke to begin the hole. The hole has started even if the stroke was made from outside the teeing area; or, if the attempted stroke misses the ball (whiff). 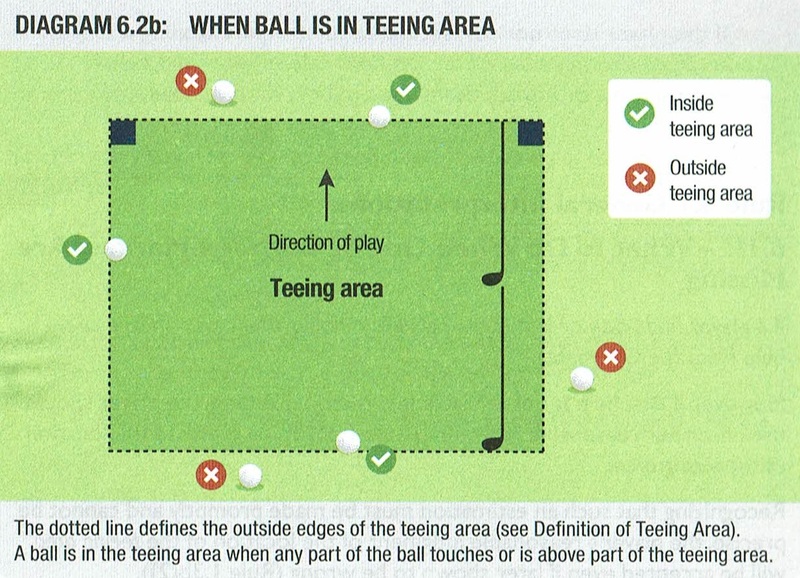 Ball Must Be Played from Inside Teeing Area - Breach is General Penalty, and player must correct the mistake by playing inside the designated teeing area. RVSGT Local Rule - If the player does not correct the mistake the Triple Bogey Maximum is given in lieu of Disqualification. Balls Used in Play of the Hole - The player must tee off with a conforming ball, and the player is normally required to play the same ball until the hole is completed. The player gets a General Penalty for making a stroke at a wrong ball or a substituted ball when substitution is not allowed by the Rules. A player making a stroke at a wrong ball must cancel the strokes taken with the wrong ball, apply the General Penalty, then proceed to continue play with his original ball. Order of Play for the starting hole is in the order of the scorecard. On subsequent holes, the lowest score on the previous hole has honors, followed by the next lowest, and so on. Fartherest from the hole has honors after teeing off. The group may agree, and is encouraged, to amend these etiquettes to speed up play. Ready golf is strongly encouraged throughout the round. Completing Play of a Hole requires that all players in the group hole out unless one or more players opt to take the triple bogey maximum provided under local rule. The designated Marker should verify and record scores for each player. If a group is waiting to hit approach shots, do this verification on the next tee. Covers the reasonable actions to fairly search for your ball in play after each stroke, during which the player must be careful, as a penalty will apply if the player acts excessively and causes improvement to the conditions affecting his next stroke. The player gets no penalty if the ball is accidentally moved in trying to find or identify it, but must then replace the ball on its original spot. Note: Search time is limited to 3 minutes. How to Fairly Search for and Identify Ball - The player may fairly search for the ball by taking reasonable actions to find and identify it, such as: Moving sand or water, and moving or bending grass, bushes, tree branches, and other growing or attached natural objects; and also breaking such objects, but only if such breaking is a result of other reasonable actions taken to find or identify the ball. If the conditions affecting the next stroke are improved as a result of actions exceeding what was reasonable for a fair search, the player gets the General Penalty for breach of Rule 8. The player must also re-create the original lie for a ball in sand, but may leave a small part of the ball visible if the ball had been covered by sand. General Penalty applies if the original lie is not re-recreated. Identifying Your Ball - The player must identify his ball before every shot to avoid possible penalty. This may be done by seeing the ball come to rest, observing the player's identifying mark on the ball, or finding an identical brand, model and number ball in the area where the player's ball is expected to be. If another ball of identical brand, model and number is found in the same area, the player cannot claim either ball as his ball, and must proceed under the lost ball rule (Rule 18). Additionally, a ball may be lifted to identify it. It's position must be marked, and it must not be cleaned beyond that required to identify it (except on the putting green, or in your own fairway as provided by Tour local rule). Once identified, the ball must be replaced in it's orginial lie. • Tee-marker for the teeing area when playing a ball from that teeing area. • Creating or eliminating holes, indentations or uneven surfaces. (4) Remove or press down sand or loose soil, unless inside the teeing area, or on the green. (1) Fairly search for his or her ball by taking reasonable actions to find and identify it (Rule 7). (2) Take reasonable actions to remove loose impediments and movable obstructions (Rule 15). (3) Take reasonable actions to mark the spot of a ball, and to lift and replace the ball under Rules 14. • When a ball is in a bunker, touching the sand right in front of or right behind the ball (see Rule 12). • Must use the least intrusive course of action to deal with the particular situation. • Place a tee, or build a tee using sand, dirt, grass, etc. • Move, bend or break growing or attached natural objects (only within the teeing area). • Alter the surface of the ground, remove or press down sand and soil, or remove dew, frost or water (Rule 6). (9) In a bunker, smooth sand to care for the course after a ball played from the bunker is now outside the bunker (Rule 12). (10) On the putting green, remove sand and loose soil and repair damage (Rule 13). (11) Move a natural object to see if it is loose. But if the object is found to be growing, attached, or embedded it must stay attached and be returned to its original position. Penalty for Breach of Rule 8: General Penalty, unless before making the next stroke the player eliminates the improved conditions by restoring to the original conditions. Covers the central principle of the game: "play the ball as it lies." If the player’s ball comes to rest and is then moved by natural forces such as wind or water, the player normally must play it from its new spot. If a ball at rest is lifted or moved by anyone or any outside influence before the stroke is made, the ball must be replaced on its original spot. Players should take care when near any ball at rest, and a player who causes his own ball or an opponent’s ball to move will normally get a penalty (except on the putting green). • To lift a ball and then replace it on its original spot. • The ball must not be replaced, no matter what caused it to move. Play the next stroke from where the ball comes to rest. • If the player's actions caused the ball to move and the stroke is completed, the player incurs a one stroke penalty. A player’s ball at rest is treated as having moved only if it is known or virtually certain that it did, otherwise, it is treated as not having moved and must be played as it lies. This determines whether the player must replace the ball or play it as it lies, and whether there is a penalty. • An outside influence, including any other player in stroke play (see Rule 9.6). (2) “Known or Virtually Certain” Standard for Deciding What Caused Ball to Move. • The player, the opponent or an outside influence is treated as having caused the ball to move only if it is known or virtually certain to be the cause. • If it is not known or virtually certain that at least one of these was the cause, the ball is treated as having been moved by natural forces). In applying this standard, all reasonably available information must be considered, which means all information the player knows or can get with reasonable effort and without unreasonably delaying play. This Rule applies only when it is known or virtually certain that a player lifted his ball at rest, or caused it to move. • When the ball moves only after the player has begun the stroke or the backswing for a stroke and then goes on to make the stroke (see Rule 9.1b). • Requires or allows the player to drop or place a ball again or to play a ball from a different place. • Measure under a Rule (such as to decide the order of play under Rule 6.4). If multiple Rule breaches result from a single act or related acts, see Rule 1. Covers preparing for and making a stroke, including advice and help the player may get from others. The principle is that golf is a game of skill and personal challenge. 10.1 Making a Stroke covers making a stroke and acts that are prohibited in doing so. A stroke is made by fairly striking at a ball with the head of a club as follows:. • The player must fairly strike at the ball with the head of the club such that there is only momentary contact between the club. • The ball and must not be pushed, scraped or scooped..
• If the player’s club accidentally hits the ball more than once, there has been only one stroke and there is no penalty. • Indirectly, through an “anchor point,” by holding a forearm against any part of the body to use a gripping hand as a stable point around which to swing the club. • A ball in play is “moving” when it is not at rest on a spot. • If a ball that has come to rest is wobbling (oscillating) but stays on or returns to its original spot, it is treated as being at rest and is not a moving ball. Exception 1 – Ball Begins to Move Only after Player Begins Backswing for Stroke: Making a stroke at a moving ball in this situation is covered by Rule 9. • The player may take relief with penalty, under Rule 16 or 17, and may lift the moving ball. In either case, the player must not delay play (Rule 5) to allow the wind or water current to move the ball to a better place. Penalty for Breach of Rule 10: General Penalty - 2 strokes..
10.2 Advice and Other Help - There are limits to the advice and other help the player may get during a round. Touch another player’s equipment to learn information (such as touching the other player’s clubs or bag to see what club is being used). No Setting Down Object to Help in Taking Stance. A player must not take a stance for the stroke using any object that was set down by or for the player to help in lining up his or her feet or body, such as a club set down on the ground to show the line of play. If the player takes a stance in breach of this Rule, he or she cannot avoid penalty by backing away from the stance and removing the object. Physical Help and Protection from Elements. A player must not make a stroke while getting physical help from any other person, or by having any other person or object deliberately positioned to give protection from sunlight, rain, wind or other elements. Penalty for Breach of Rules 10.1 & 10.2: General Penalty. Rule covers what to do if the player’s ball in motion hits a person, animal, equipment or anything else on the course. When this happens accidentally, there is no penalty and the player normally must accept the result, whether favorable or not, and play the ball from where it comes to rest. Rule 11 also restricts a player from deliberately taking actions to affect where any ball in motion might come to rest. This Rule applies any time a ball in play is in motion (whether after a stroke or otherwise), except when a ball has been dropped in a relief area and has not yet come to rest. That situation is covered by Rule 14. • There is no penalty to any player. • This is true even if the ball hits the player, the opponent or any other player or any of their caddies or equipment. • When Ball Is Anywhere Except on Putting Green: The player must drop the original ball or another ball within one club-length of the estimated point where the ball first came to rest, no closer to the hole, in the same area of the course (General, Bunker, Penalty, Teeing area). • When Ball Is on Putting Green: The player must place the original ball or another ball on the estimated spot right under where the ball first came to rest on the person, animal or moving outside influence, using the procedures for replacing a ball under Rules 14. • Ball in Motion Hits Another Ball at Rest (General Penalty) or Ball-Marker on Putting Green. The stroke counts and the ball must be played as it lies. 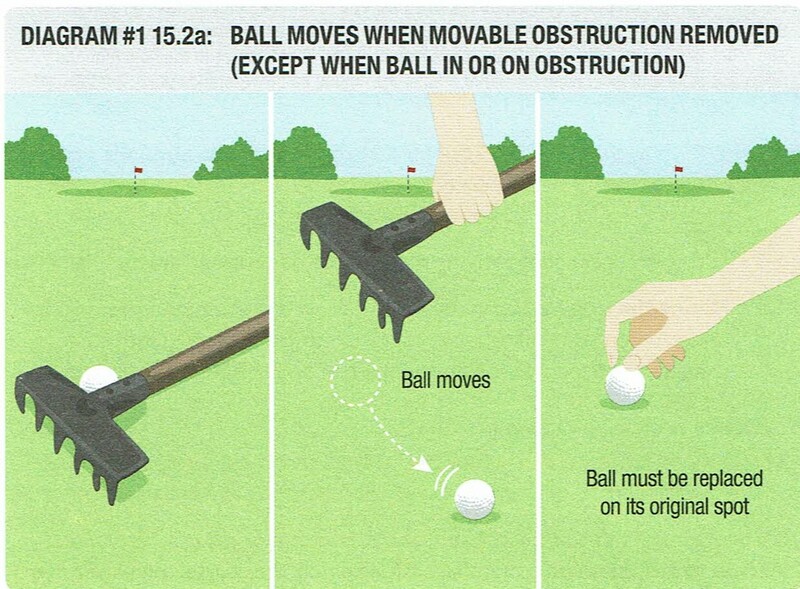 • Ball in Motion Accidentally Hits Flagstick or Person Attending Flagstick, see Rule 13. • The ball in motion hits any equipment or other object (except a ball-marker or another ball at rest before the ball was played or otherwise went into motion) or any person that a player deliberately positioned or left in a particular location so that the equipment, object or person might deflect or stop the ball in motion. A player’s right to have another player's ball or ball-marker lifted before a stroke is covered under Rule 15. • He deliberately deflects or stops any ball in motion. • This is true whether it is the player’s own ball or a ball played by another player in stroke play. Exception – Ball Moving in Water: There is no penalty if a player lifts his or her ball moving in water, in temporary water, or in a penalty area when taking relief under Rule 16 or 17 (see Rule 10.1d Exception 3). • When Ball Would Have Come to Rest Anywhere on Course Except on Putting Green, player must drop within one club-length, no closer to the hole, in the same area of the course. (Rule 14). • When Ball Would Have Come to Rest on Putting Green. The player must place ball on the estimated spot where the ball would have come to rest. • When Ball Would Have Come to Rest Out of Bounds. The player must take stroke and-distance relief under Rule 18. (2) Stroke Made from on the Putting Green: The stroke does not count, and the original ball or another ball must be replaced on its original spot (which if not known must be estimated) (Rule 14). Penalty for Playing Incorrectly Substituted Ball or Playing Ball from a Wrong Place in Breach of Rule 11.1 or 11.2: General Penalty under Rule 6 or 14. • Any other player equipment (other than a ball at rest anywhere except the putting green or a ball-marker anywhere on the course). Rule 12 is a specific Rule for bunkers, which are specially prepared areas intended to test the player’s ability to play a ball from the sand. To make sure the player confronts this challenge, there are some restrictions on touching the sand before the stroke is made and on where relief may be taken for a ball in a bunker.  In or on a loose impediment, movable obstruction, abnormal course condition or integral object that touches sand in the bunker or is on ground where sand normally would be. If a ball lies on soil or grass or other growing or attached natural objects inside the edge of the bunker without touching any sand, the ball is not in the bunker. If part of the ball is both in a bunker and in another area of the course, see Rule 2 to identify the specific area of the course where the ball lies. This Rule applies both during a round and while play is stopped under Rule 5. Before playing a ball in a bunker, a player may remove loose impediments and movable obstructions under Rule 15. This includes any reasonable touching or movement of the sand in the bunker that happens while doing so.  In making the backswing for a stroke. • Striking the sand in frustration or anger. But the player gets the General Penalty if his or her actions in touching the sand improve the conditions affecting the stroke in breach of Rule 8. • Smooth sand in the bunker to care for the course without penalty under Rule 8.1a. • The sand in the bunker is on the player’s line of play for the next stroke from outside the bunker. But if the ball played from the bunker comes back into the bunker, or the player takes relief by dropping a ball in the bunker, the restrictions in Rules 12.2b(1) and 8.1a again apply to that ball in play in the bunker. • Unplayable ball (Rule 19.3). Putting greens are specially prepared for playing the ball along the ground and there is a flagstick for the hole on each putting green, so certain different Rules apply than for other areas of the course. This Rule allows the player to do things on the putting green that are normally not allowed off the putting green, such as being allowed to mark, lift, clean and replace a ball and to repair damage and remove sand and loose soil on the putting green. There is no penalty for accidentally causing a ball or ball-marker to move on the putting green. • Lies on or in anything (such as a loose impediment or an obstruction) and is inside the edge of the putting green. If part of the ball is both on the putting green and in another area of the course, see Rule 2.2c. • A ball on the putting green may be lifted and cleaned (see Rule 14.1). • The spot of the ball must be marked before it is lifted and the ball must be replaced on its original spot (see Rule 14.2). (1) Removal of Sand and Loose Soil. Sand and loose soil on the putting green (but not anywhere else on the course) may be removed without penalty. • Without unreasonably delaying play (see Rule 5.6a). But if the player improves the putting green by taking actions that exceed what is reasonable to restore the putting green to its original condition (such as by creating a pathway to the hole or by using an object that is not allowed), the player gets the General Penalty for breach of Rule 8. • Embedded objects (such as a stone, acorn or tee). • Natural wear of the hole. (1) No Penalty for Accidentally Causing Ball to Move if the player, opponent or another player in stroke play accidentally moves the player’s ball or ball-marker. • Ball Already Lifted and Replaced. The ball must be replaced on its original spot (which if not known must be estimated) (see Rule 14). • Ball Not Already Lifted and Replaced. The ball must be played from its new spot (see Rule 9.3). Exception – Testing Greens When between Two Holes: Between two holes, a player may rub the surface of the hole just completed and on any practice green. Penalty for Testing the Putting Green or a Wrong Green in Breach of Rule 13.1e: General Penalty. • A wrong green physically interferes with the player’s area of intended stance or area of intended swing. (2) Relief Must Be Taken. When there is interference by a wrong green, a player must not play the ball as it lies. • Reference Point: The nearest point of complete relief in the same area of the course where the original ball came to rest. • Size of Relief Area Measured from Reference Point: One club-length, no closer to the hole, taking complete relief from the wrong green. (3) No Relief When Player Chooses a Club, Stance, Swing, or Direction of Play which is Clearly Unreasonable. Penalty for Playing Incorrectly Substituted Ball or Playing Ball from a Wrong Place in Breach of Rule 13.1: General Penalty under Rule 6.3b or 14.7a. This Rule covers the player’s choices for dealing with the flagstick, and it applies to a ball played from anywhere on the course, whether on or off the putting green. (1) Player May Leave Flagstick in Hole. The player may make a stroke with the flagstick left in the hole, so that it is possible for the ball in motion to hit the flagstick. • Having a removed flagstick put back in the hole. • The player must not try to gain an advantage by deliberately moving the flagstick to a position other than centred in the hole. • If the player does so and the ball in motion then hits the flagstick, he or she gets the general penalty. • The ball must be played as it lies. • The player must not deliberately move or remove the flagstick to affect where the player’s ball in motion might come to rest (such as to avoid having the ball hit the flagstick). If this is done, the player gets the general penalty. • But there is no penalty if the player has the flagstick in the hole moved or removed for any other reason, such as when he reasonably believes that the ball in motion will not hit the flagstick before coming to rest. (4) Limitation on Other Players Moving or Removing Flagstick When Player Has Decided to Leave It in Hole. When the player has left the flagstick in the hole and has not authorized anyone to attend the flagstick (see Rule 13.2b(1)), another player must not deliberately move or remove the flagstick to affect where the player’s ball in motion might come to rest. • If another player does so before or during the stroke and the player makes the stroke without being aware of this, or does so while the player’s ball is in motion after the stroke, that other player gets the general penalty.  Is not aware that the player is about to play or that the player’s ball is in motion. (1) Player May Have Flagstick Removed from Hole.  Then removing the flagstick after the stroke is made. • The player sees any other person holding the flagstick in, above or next to the hole or standing right next to the hole, and the player makes the stroke without asking that person to move away or to leave the flagstick in the hole. (2) What to Do If Ball Hits Flagstick or Person Attending Flagstick. • Ball Accidentally Hits Flagstick or Person Who Removed or Is Attending It. If the player’s ball in motion accidentally hits the flagstick or the person who removed or is attending it (or anything the person is holding), there is no penalty and the ball must be played as it lies.  Where Ball Is Played from. The player must not play the ball as it lies and instead must take relief under Rule 11.2c.  When Penalty Applies. If the person who deliberately deflected or stopped the ball was another player, that player gets the general penalty for a breach of Rule 11.2. • The person who attended or removed the flagstick (or anything the person was holding), when he or she deliberately failed to move out of the way of the ball. Exception – Restrictions on Deliberately Moving Flagstick to Affect a Ball in Motion (see Rule 11.3). • If any part of the ball is in the hole below the surface of the putting green, the ball is treated as holed even if the entire ball is not below the surface.  The ball is not holed and must be played as it lies.  If the flagstick is removed and the ball moves (whether it falls into the hole or moves away from the hole), there is no penalty and the ball must be replaced on the lip of the hole (see Rule 14.2). Penalty for Playing Incorrectly Substituted Ball or Playing Ball from a Wrong Place in Breach of Rule 13.2c: General Penalty under Rule 6.3b or 14.7a. • The player is allowed a reasonable time to reach the hole and ten more seconds to wait to see whether the ball will fall into the hole. • If the ball falls into the hole in this waiting time, the player has holed out with the previous stroke.  The ball is treated as being at rest.  If the ball then falls into the hole before it is played, the player has holed out with the previous stroke, but gets one penalty stroke added to the score for the hole. • In stroke play, the player who lifted or moved the ball gets the general penalty (two penalty strokes). The ball must be replaced on the lip of the hole (see Rule 14.2). Rule 14 covers when and how the player may mark the spot of a ball at rest and lift and clean the ball and how to put a ball back into play so that the ball is played from the right place.  When a lifted or moved ball is to be replaced, the same ball must be set down on its original spot. 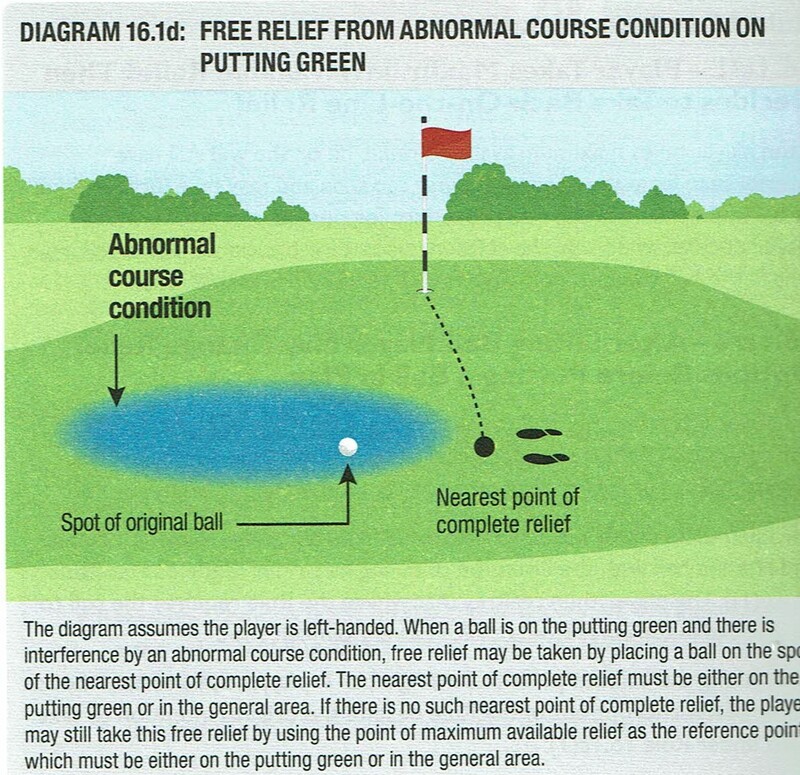  When taking free relief (Rule 15) or penalty relief (Rule 16), a substituted ball or the original ball must be dropped in a particular relief area. A mistake in using these procedures may be corrected without penalty before the ball is played, but the player gets a penalty if he or she plays the ball from the wrong place. This Rule applies to the deliberate “lifting” of a player’s ball at rest, which includes picking up the ball by hand, rotating it or otherwise deliberately causing it to move from its spot. • Hold a club on the ground right behind or right next to the ball. If the spot is marked with a ball-marker, after replacing the ball the player must remove the ball-marker before making a stroke. If the player lifts the ball without marking its spot, marks its spot in a wrong way or makes a stroke with a ball-marker left in place, the player gets one penalty stroke. c. Cleaning Lifted Ball A ball lifted from the putting green may always be cleaned (see Rule 13.1b). • To See If It Is Cut or Cracked. Cleaning is not allowed (see Rule 4.2c(1)). • To Identify It. Cleaning is allowed only as needed to identify it (see Rule 7.3). • Because It Interferes with Play. Cleaning is not allowed (see Rule 15.3b(2)). • To See If It Lies in Condition Where Relief Is Allowed. Cleaning is not allowed, unless the player then takes relief under a Rule (see Rule 16.4). If the player cleans a lifted ball when not allowed, he gets one penalty stroke. This Rule applies whenever a ball is lifted or moved and a Rule requires it to be replaced on a spot. • The original ball was played by another player as a wrong ball (see Rule 6.3c(2)). • Any person who lifted the ball or caused it to move (even if that person was not allowed to do so under the Rules). If the player plays a ball that was replaced by someone not allowed to do so, the player gets one penalty stroke. (2) How Ball Must Be Replaced. The ball must be replaced by setting it down on the required spot and letting it go so that it stays on that spot. If the player plays a ball that was replaced in a wrong way but on the required spot, the player gets one penalty stroke. • The “spot” of the ball includes its vertical location relative to the ground. • This means that the ball must be replaced on its original spot on, under or against such object. If any loose impediments were removed as a result of the ball being lifted or moved or before the ball was replaced, they do not need to be replaced. For restrictions on removing loose impediments before replacing a lifted or moved ball see Rule 15.1a, Exception 1. • In replacing the ball on its original spot (which if not known must be estimated) (see Rule 14.2c), the player must re-create the original lie as much as possible. • In re-creating the lie, the player may leave a small part of the ball visible if the ball had been covered by sand. If the player fails to re-create the lie in breach of this Rule, the player has played from a wrong place - General Penalty. • In the same area of the course as that spot. If the player knows that the original lie was altered but does not know what the lie was, the player must estimate the original lie and replace the ball under (1) or (2). Exception – For Lies Altered While Play is Stopped and Ball Has Been Lifted, see Rule 5.7d. If the player tries to replace a ball but it does not stay on its original spot, the player must try a second time. • The spot must not be nearer the hole. • Original Spot in General Area. The nearest spot must be in the general area. • Original Spot in Bunker or Penalty Area. The nearest spot must be either in the same bunker or in the same penalty area. • Original Spot on Putting Green. The nearest spot must be either on the putting green or in the general area. Penalty for Playing Incorrectly Substituted Ball or Playing Ball from a Wrong Place in Breach of Rule 14.2: General Penalty under Rule 6.3b or 14.7a. This Rule applies whenever a player must drop a ball in taking relief under a Rule, including when the player must complete taking relief by placing a ball under Rule 14.3c(2). If the player improves the relief area before or when dropping a ball, see Rules 8 and 15.1 for clarification. • Does not touch any part of the player’s body or equipment before it hits the ground. (3) Ball Must Be Dropped in Relief Area. The player may stand either inside or outside the relief area when dropping the ball. • The player must drop a ball again in the right way, and there is no limit to the number of times the player must do so. • A ball dropped in the wrong way does not count as one of the two drops required before a ball must be placed under Rule 14.3c(2). 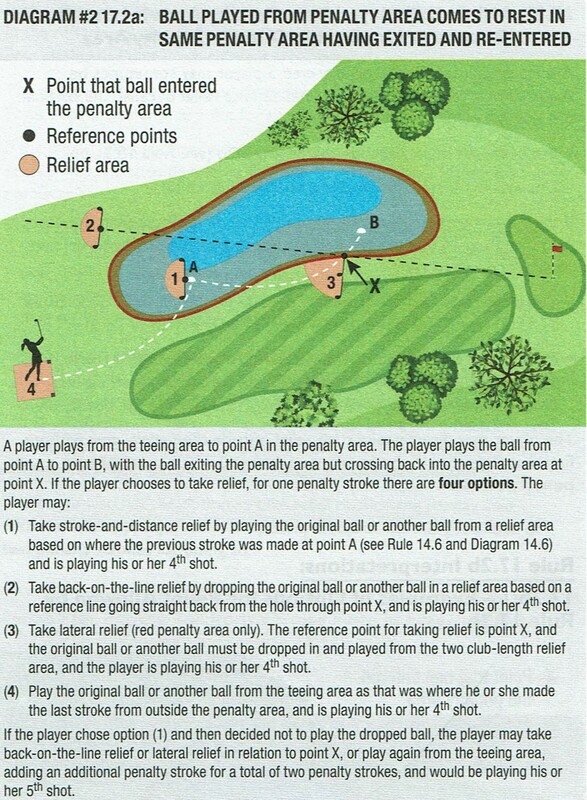 • If the ball was played from the relief area, the player gets one penalty stroke (but has not played from a wrong place under Rule 14.7a). • But if the ball was played from outside the relief area, or after it was placed when required to be dropped (no matter where it was played from), the player gets the general penalty. c. Ball Dropped in Right Way Must Come to Rest in Relief Area This Rule applies only when a ball is dropped in the right way under Rule 14.3b. (1) Player Has Completed Taking Relief When Ball Dropped in Right Way Comes to Rest in Relief Area. The ball must come to rest in the relief area. • If the ball comes to rest in the relief area, the player has completed taking relief and must play the ball as it lies. • If the ball comes to rest outside the relief area, the player must use the procedures in Rule 14.3c(2). In either case, there is no penalty to any player if a ball dropped in the right way accidentally hits any person, equipment or other outside influence before coming to rest. Exception – When Ball Dropped in Right Way is Deliberately Deflected or Stopped by Any Person, see Rule 14.3d. (2) What to Do if Ball Dropped in Right Way Comes to Rest Outside Relief Area. 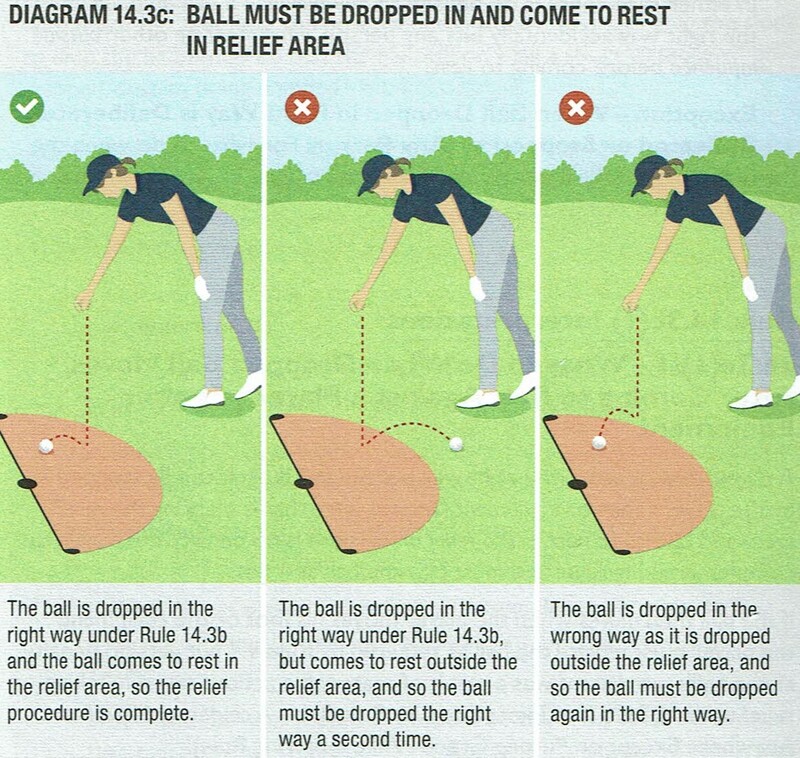 If the ball comes to rest outside the relief area, the player must drop a ball in the right way a second time. If the second dropped ball also comes to rest outside the relief area, the player must complete taking relief by placing a ball using the procedures for replacing a ball in Rules 14.2. • The player must place a ball on the spot where the ball dropped the second time first touched the ground. • If the placed ball does not stay at rest on that spot, the player must place a ball on that spot a second time. • If the ball placed a second time also does not stay on that spot, the player must place a ball on the nearest spot where the ball will stay at rest, subject to the limits in Rule 14.2e. • The player must drop a ball again, using the procedures in Rule 14.3b (which means that the ball that was deliberately deflected or stopped does not count as one of the two drops required before a ball must be placed under Rule 14.3c(2)). • If the ball was deliberately deflected or stopped by any player or his or her caddie, that player gets the general penalty. • The dropped ball is treated as having come to rest outside the relief area and counts as one of the two drops required before a ball must be placed under Rule 14.3c(2). Penalty for Playing Ball from a Wrong Place or Playing Ball that was Placed Instead of Dropped in Breach of Rule 14.3: General Penalty under Rule 14.7a. • Replaced, dropped or placed (1) in a wrong place, (2) in a wrong way or (3) by using a procedure that did not apply. A replaced ball is in play even if the ball-marker marking its spot has not been removed. • The player may lift the ball without penalty and correct the mistake. • But this is allowed only before the ball is played. (1) When Ball Was Put in Play under Rule That Did Not Apply. • In correcting this mistake, the player may use any Rule that applies to his or her situation. • For example, if the player mistakenly took unplayable ball relief for his or her ball in a penalty area (which Rule 19.1 does not allow), the player must correct the mistake by either replacing the ball (if it had been lifted) under Rule 9.4, or taking penalty relief under Rule 17 and may use any relief option under that Rule that applies to his or her situation. (2) When Ball Was Put in Play under Rule That Applied but Ball Was Dropped or Placed in Wrong Place. • In correcting this mistake, the player must go on to take relief under the same Rule but may use any relief option under that Rule that applies to his or her situation. 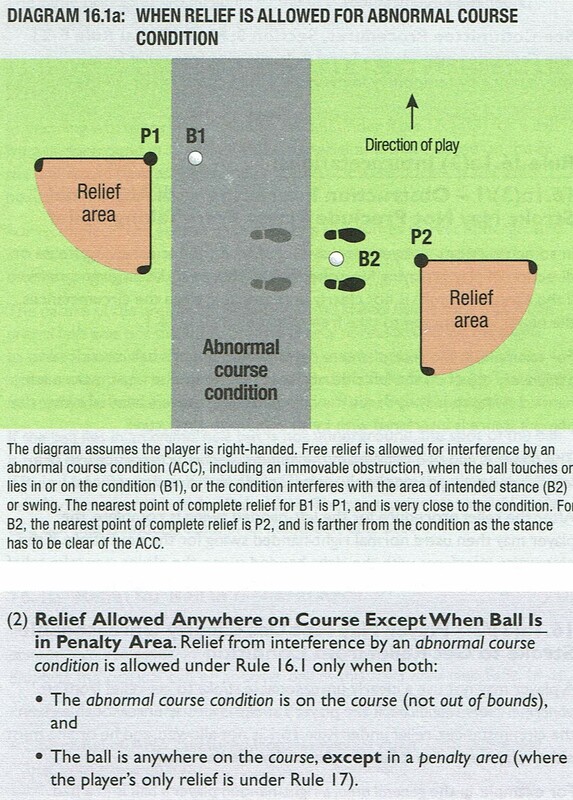 • For example, if when taking relief for an unplayable ball, the player used the lateral relief option Rule (19.2c) and mistakenly dropped the ball outside the required relief area, in correcting the mistake the player must go on to take relief under Rule 19.2 but may use any of the relief options in Rule 19.2a, b or c.
(3) When Ball Was Put in Play under Rule That Applied and Was Dropped or Placed in Right Place, but Rule Requires Ball to Be Dropped or Placed Again. • In correcting this mistake, the player must go on to take relief using the same Rule and the same relief option under that Rule. • For example, if when taking relief for an unplayable ball, the player used the lateral relief option (Rule 19.2c) and the ball was (1) dropped in the right relief area but (2) was dropped in a wrong way (see Rule 14.3b) or came to rest outside the relief area (see Rule 14.3c), in correcting the mistake the player must go on to take relief under Rule 19.2 and must use the same relief option (lateral relief under Rule 19.2c). • The player does not count any penalty for actions that were taken relating to that ball after the mistake and before it was lifted, such as for accidentally causing it to move (see Rule 9.4b). • But if those same actions were also in breach of a Rule relating to the ball that was put in play to correct the mistake (such as when those actions improved the conditions affecting the stroke for both the ball now in play and the original ball before it was lifted), the penalty applies to the ball now in play. This Rule applies whenever a player is required or allowed under the Rules to make the next stroke from where a previous stroke was made (that is, when taking stroke-and-distance relief, or playing again after a stroke that is cancelled or otherwise does not count). • How the player must put a ball in play depends on the area of the course where that previous stroke was made. • In all of these situations, the player may use either the original ball or another ball. The original ball or another ball must be played from anywhere inside the teeing area (and may be teed) under Rule 6.2b. • Reference Point: The spot where the previous stroke was made (which if not known must be estimated).  Must not be nearer the hole than the reference point. The original ball or another ball must be placed on the spot where the previous stroke was made (which if not known must be estimated) (see Rule 14.2), using the procedures for replacing a ball under Rules 14.2b(2) and 14.2e. Penalty for Playing Ball from a Wrong Place in Breach of Rule 14.6: General Penalty Under Rule 14.7a. • A player must make each stroke from where his or her ball comes to rest, except when the Rules require or allow the player to play a ball from another place (see Rule 9.1). • A player must not play his or her ball in play from a wrong place. • Correcting the mistake and playing out the hole while taking the General Penalty. • Picking up and taking the Local Tour Rule Triple Bogey Max for the hole.  These movable natural and artificial objects are not treated as part of the challenge of playing the course, and a player is normally allowed to remove them when they interfere with play. 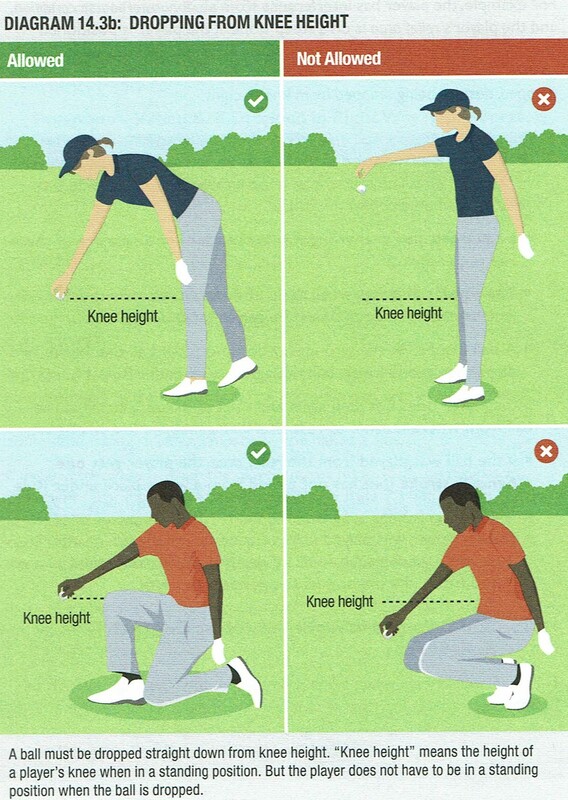  But the player needs to be careful in moving loose impediments near his or her ball off the putting green, because there will be a penalty if moving them causes the ball to move. Without penalty, a player may remove a loose impediment anywhere on or off the course, and may do so in any way (such as by using a hand or foot or a club or other equipment). This includes a relief area where a ball is to be dropped, or placed, but not replaced (see Exception 1). • A player must not deliberately remove a loose impediment that, if moved when the ball was at rest, would have been likely to have caused the ball to move. • If the player does so, he or she gets one penalty stroke, but the removed loose impediment does not need to be replaced. Exception 2 – Restrictions on Deliberately Removing Loose Impediments to Affect Ball in Motion (see Rule 11.3). • The ball must be replaced on its original spot (which if not known must be estimated) (see Rule 14.2). • If the moved ball had been at rest anywhere except on the putting green (see Rule 13.1d) or in the teeing area (see Rule 6.2b(6)), the player gets one penalty stroke under Rule 9.4b, except when Rule 7.4 applies (no penalty for ball moved during search) or when another exception to Rule 9.4b applies. Penalty for Playing Incorrectly Substituted Ball or Playing Ball from a Wrong Place in Breach of Rule 15.1: General Penalty Under Rule 6.3b or 14.7a. 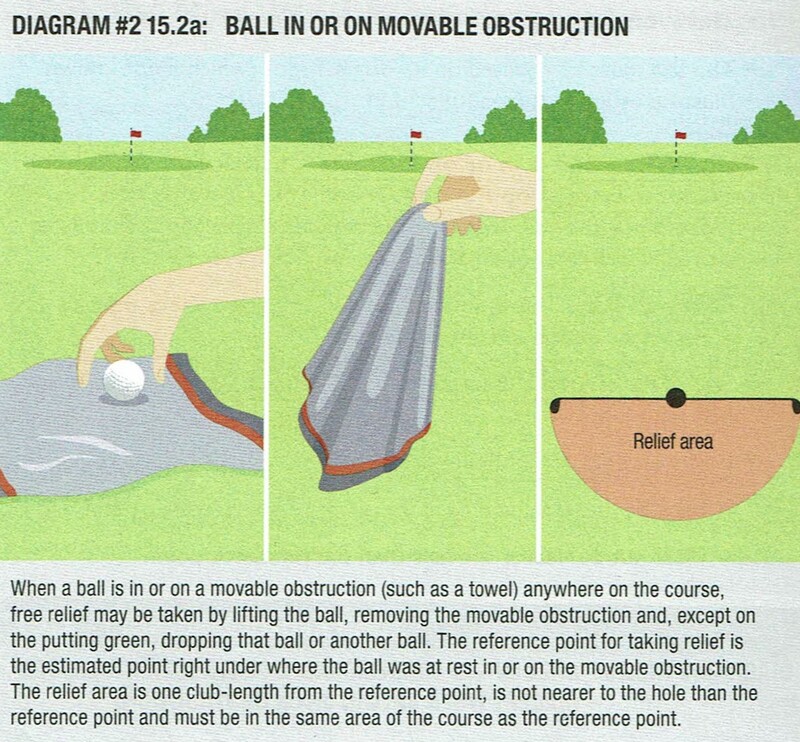 This Rule covers free relief that is allowed from artificial objects that meet the definition of movable obstruction. It does not give relief from immovable obstructions (a different type of free relief is allowed under Rule 16.1), or boundary objects, or integral objects (no free relief is allowed). (1) Removal of Movable Obstruction. Without penalty, a player may remove a movable obstruction anywhere on or off the course and may do so in any way. Exception 1 – Tee Markers Must Not be Moved When Ball Will Be Played from Teeing Area (see Rules 6.2b(4) and 8.1a(1)). 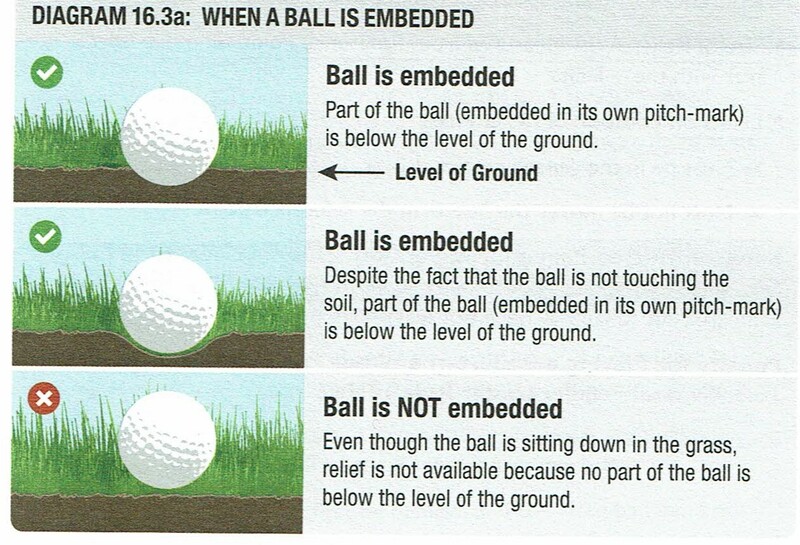 Exception 2 – Restrictions on Deliberately Removing Movable Obstruction to Affect a Ball in Motion (see Rule 11.3). • Reference Point: The estimated point right under where the ball was at rest in or on the movable obstruction. • In the same area of the course as the reference point and not nearer the hole. • Lifting the ball and removing the movable obstruction, and • Placing the original ball or another ball on the estimated spot right under where the ball was at rest in or on the movable obstruction, using the procedures for replacing a ball under Rule 14.2b(2) and 14.2e. • The player may take free relief under Rule 15.2a(2) or 15.2a(3), using the estimated point right under where the ball last crossed the edge of the movable obstruction on the course as the reference point.  The original ball is no longer in play and must not be played.  This is true even if it is then found on the course before the end of the three minute search time (see Rule 6.3b). But if it is not known or virtually certain that the ball came to rest in or on a movable obstruction and the ball is lost, the player must take stroke-and-distance relief under Rule 18.2. Penalty for Playing Incorrectly Substituted Ball or Playing Ball from a Wrong Place in Breach of Rule 15.2: General Penalty Under Rule 6.3b or 14.7a. a. Ball on Putting Green Helping Play Rule 15.3a applies only to a ball at rest on the putting green, not anywhere else on the course. • Mark the spot of the ball and lift it under Rule 13.1b if it is his or her own ball, or if the ball belongs to another player, require the other player to mark the spot and lift the ball (see Rule 14.1). • The lifted ball must be replaced on its original spot (see Rule 14.2). • If two or more players agree to leave a ball in place to help any player, and that player then makes a stroke with the helping ball left in place, each player who made the agreement gets the general penalty (two penalty strokes). • Is close enough to distract the player in making the stroke. • The player may require the other player to mark the spot and lift the ball (see Rule 14.1), and the ball must not be cleaned (except when lifted from the putting green under Rule 13.1b) and must be replaced on its original spot (see Rule 14.2). • If the other player does not mark the spot before lifting the ball, or cleans the lifted ball when not allowed, he or she gets one penalty stroke. • In stroke play only, a player required to lift his or her ball under this Rule may play first instead. A player is not allowed to lift his or her ball under this Rule based only on the player’s own belief that the ball might interfere with another player’s play. If the player lifts his or her ball when not required to do so by the other player (except when lifting the ball on the putting green under Rule 13.1b), the player gets one penalty stroke. • If the ball-marker belongs to another player, require that player to move the ballmarker out of the way, for the same reasons as he or she may require a ball to be lifted under Rules 15.3a and 15.3b. Either the lifted ball must be replaced on its original spot (see Rule 14.2) or the ball-marker must be replaced to mark that spot. • Refuses to lift his or her ball or move his or her ball-marker when required to do so and a stroke is then made by the other player whose play might have been helped or interfered with. Penalty for Playing Incorrectly Substituted Ball or Playing Ball from a Wrong Place in Breach of Rule 15.3: General Penalty under Rule 6.3b or 14.7a. Rule 16 covers when and how the player may take free relief by playing a ball from a different place, such as when there is interference by an abnormal course condition or a dangerous animal condition, or when a player’s ball is embedded in its own pitch mark in the general area.  These conditions are not treated as part of the challenge of playing the course, and free relief is generally allowed except in a penalty area.  The player normally takes relief by dropping a ball in a relief area based on the nearest point of complete relief. • This Rule does not give relief from movable obstructions (a different type of free relief is allowed under Rule 15.2a) or boundary objects or integral objects (no free relief is allowed). • Only when the ball is on the putting green, an abnormal course condition on or off the putting green intervenes on the line of play. 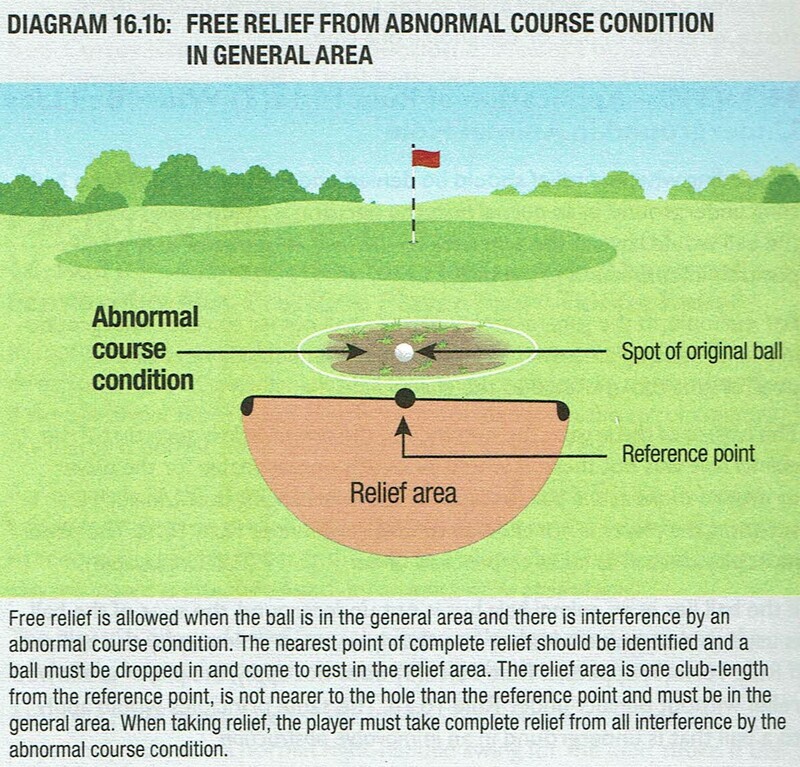 If the abnormal course condition is close enough to distract the player but does not meet any of these requirements, there is no interference under this Rule. • The ball is anywhere on the course, except in a penalty area (where the player’s only relief is under Rule 17). • When interference exists only because a player chooses a club, type of stance or swing or direction of play that is clearly unreasonable under the circumstances. • Reference Point: The nearest point of complete relief in the general area. • Size of Relief Area Measured from Reference Point: One club-length in the general area, no closer to hole. Must take complete relief from abnormal condition. 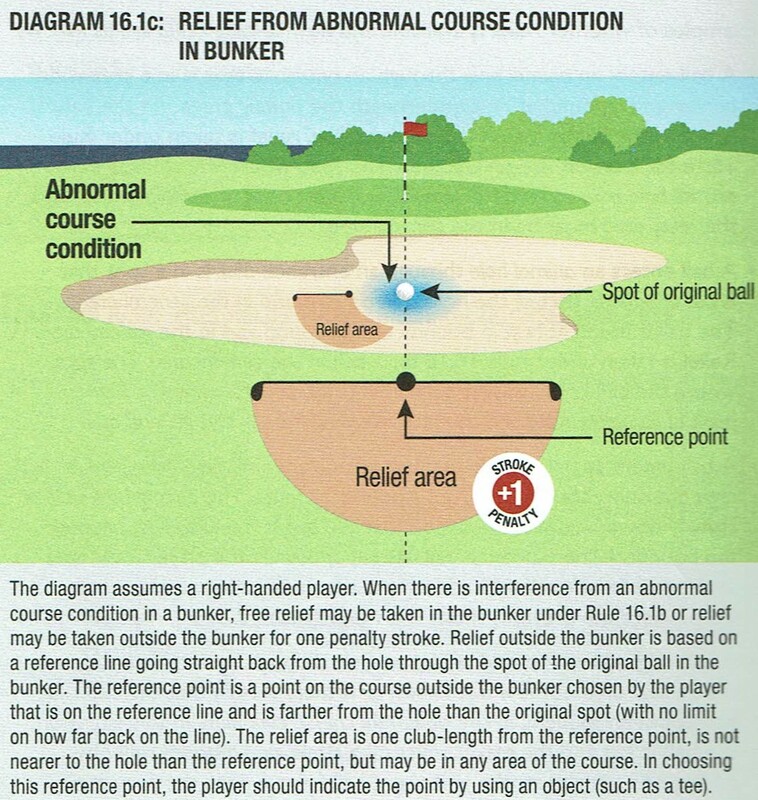 • The nearest point of complete relief and the relief area must be in the bunker. • If there is no such nearest point of complete relief in the bunker, the player may still take this relief by using the point of maximum available relief in the bunker as the reference point.  In choosing this reference point, the player should indicate the point by using an object (such as a tee).  If the player drops the ball without having chosen this point, the reference point is treated as being the point on the line that is the same distance from the hole as where the dropped ball first touched the ground. 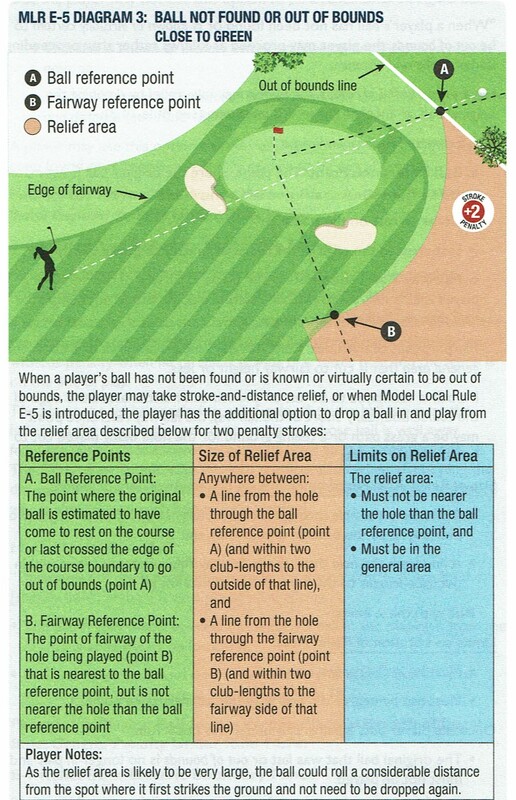  If more than one area of the course is located within one club-length of the reference point, the ball must come to rest in the relief area in the same area of the course that the ball first touched when dropped in the relief area. If a player’s ball is on the putting green and there is interference by an abnormal course condition on the course, the player may take free relief by placing the original ball or another ball on the spot of the nearest point of complete relief, using the procedures for replacing a ball under Rules 14.2b(2) and 14.2e. • The nearest point of complete relief must be either on the putting green or in the general area. • If there is no such nearest point of complete relief, the player may still take this free relief by using the point of maximum available relief as the reference point, which must be either on the putting green or in the general area. • The player may take relief under Rule 16.1b, c or d, using the estimated point where the ball last crossed the edge of the abnormal course condition on the course as the spot of the ball for purposes of finding the nearest point of complete relief. But if it is not known or virtually certain that the ball came to rest in or on an abnormal course condition and the ball is lost, the player must take stroke-and-distance relief under Rule 18.2. • No Play Zone in General Area. The player must take free relief under Rule 16.1b. • No Play Zone in Bunker. The player must take free relief or penalty relief under Rule 16.1c(1) or (2). • No Play Zone on Putting Green. The player must take free relief under Rule 16.1d. • Take unplayable ball relief under Rule 19. For what to do when there is interference by a no play zone for a ball in a penalty area, see Rule 17.1e. Penalty for Playing Ball from a Wrong Place in Breach of Rule 16.1: General Penalty under Rule 14.7a. • When interference exists only because the player chooses a club, type of stance or swing or direction of play that is clearly unreasonable under the circumstances. (1) When Ball Is Anywhere Except Penalty Area. The player may take relief under Rule 16.1b, c or d, depending on whether the ball is in the general area, in a bunker or on the putting green. • Free Relief: Playing from Inside Penalty Area. 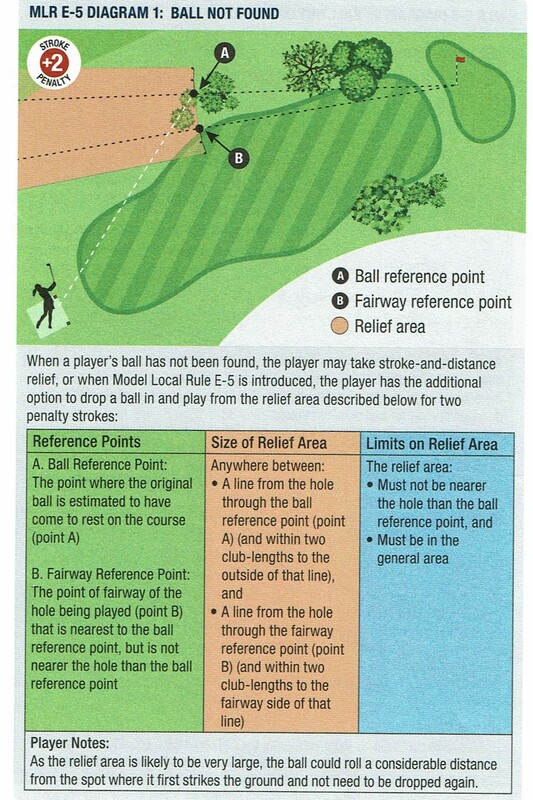 The player may take free relief under Rule 16.1b, except that the nearest point of complete relief and the relief area must be in the penalty area. • Penalty Relief: Playing from Outside Penalty Area.  The player may take penalty relief under Rule 17.1d.  If there is interference by a dangerous animal condition where the ball would be played after taking this penalty relief outside the penalty area, the player may take further relief under (1) without additional penalty. For purposes of this Rule, the nearest point of complete relief means the nearest point (not nearer the hole) where the dangerous animal condition does not exist. Penalty for Playing Ball from a Wrong Place in Breach of Rule 16.2: General Penalty under Rule 14.7a. (1) Ball Must Be Embedded in General Area. 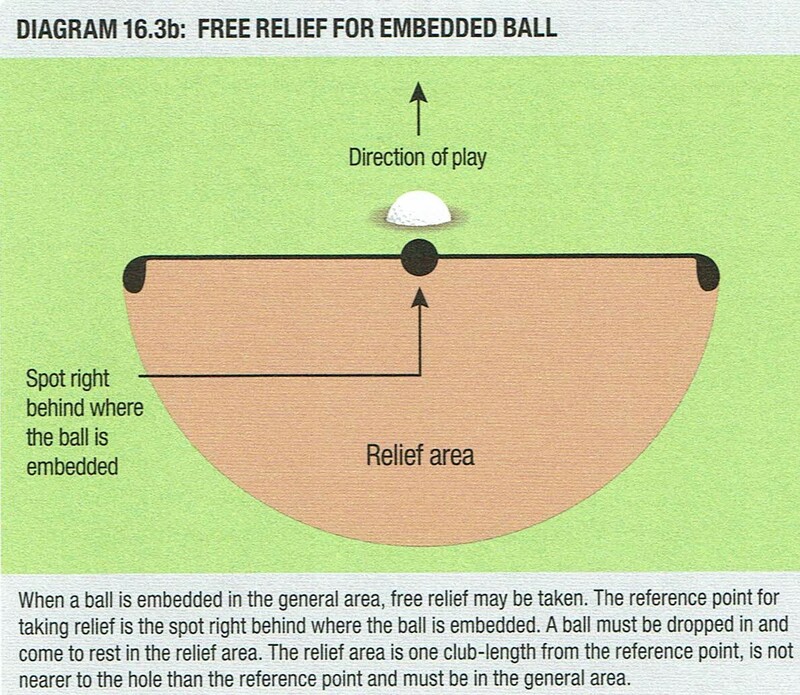 Relief is allowed under Rule 16.3b only when a player’s ball is embedded in the general area. • There is no relief under this Rule if the ball is embedded anywhere except in the general area. • But if the ball is embedded on the putting green, the player may mark the spot of the ball and lift and clean the ball, repair the damage caused by the ball’s impact, and replace the ball on its original spot (see Rule 13.1c(2)). • When interference by anything other than the ball being embedded makes the stroke clearly unreasonable (for example, when a player is unable to make a stroke because of where the ball lies in a bush). • Part of the ball is below the level of the ground. • The ball was dropped in taking relief under a Rule. • Reference Point: The spot right behind where the ball is embedded. Penalty for Playing a Ball from a Wrong Place in Breach of Rule 16.3: General Penalty under Rule 14.7a. • The spot of the ball must first be marked, and the lifted ball must not be cleaned (except on the putting green) (see Rule 14.1). If the player lifts the ball without having this reasonable belief (except on the putting green where the player may lift under Rule 13.1b), he gets one penalty stroke. If relief is allowed and the player takes relief, there is no penalty even if the player did not mark the spot of the ball before lifting it, or cleaned the lifted ball. • The ball must be replaced on its original spot (see Rule 14.2). Penalty for Playing Incorrectly Substituted Ball or Playing Ball from a Wrong Place in Breach of Rule 16.4: General Penalty under Rule 6.3b or 14.7a. Penalty areas are defined as either red or yellow. This affects the player’s relief options (see Rule 17.1d). A player may stand in a penalty area to play a ball outside the penalty area, including after taking relief from the penalty area. • Is above the edge or any other part of the penalty area. 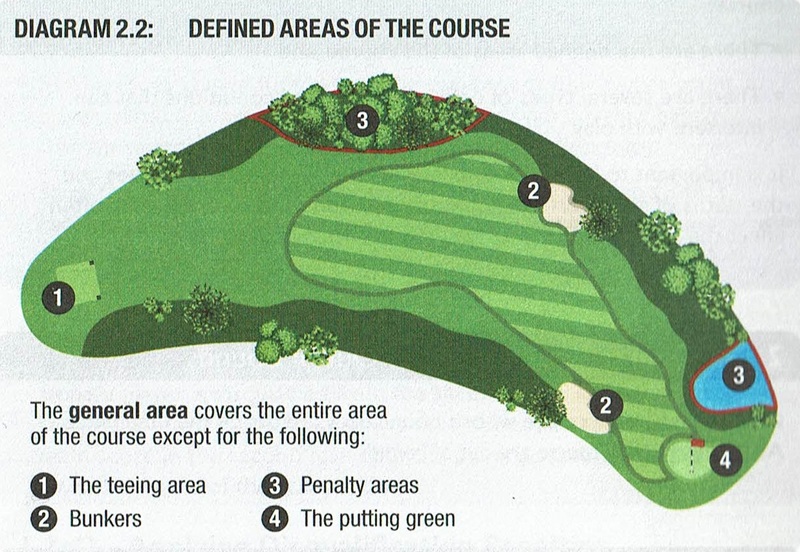 If part of the ball is both in a penalty area and in another area of the course, see Rule 2.2c. • Play a ball from outside the penalty area by taking penalty relief under Rule 17.1d or 17.2. Exception – Relief Must Be Taken from Interference by No Play Zone in Penalty Area (see Rule 17.1e). • The player may take penalty relief under Rule 17.1d or 17.2.  This is true even if it is then found on the course before the end of the threeminute search time (see Rule 6.3b). But if it is not known or virtually certain that the ball came to rest in a penalty area and the ball is lost, the player must take stroke-and-distance relief under Rule 18.2. (1) Stroke-and-Distance Relief. The player may play the original ball or another ball from where the previous stroke was made (see Rule 14.6). • Mark the point, drop ball within one club length, no closer to hole, not in the same penalty area. • If more than one area of the course is located within one club-length of the reference point, the ball must come to rest in the relief area in the same area of the course that the ball first touched when dropped in the relief area. • Reference Point: The estimated point where the original ball last crossed the edge of the red penalty area. • Mark the point, drop ball within two club-lengths, no closer to hole, not in same penalty area. • If more than one area of the course is located within two club-lengths of the reference point, the ball must come to rest in the relief area in the same area of the course that the ball first touched when dropped in the relief area. (1) When Ball Is in No Play Zone in Penalty Area. The player must take penalty relief under Rule 17.1d or 17.2. (2) When No Play Zone on Course Interferes with Stance or Swing for Ball in Penalty Area.  Reference Point: The nearest point of complete relief from the no play zone. Drop within one club-length, not nearer the hole, in the same penalty area where the ball lies. • When interference exists only because the player chooses a club, type of stance or swing, or direction of play that is clearly unreasonable under the circumstances. For what to do when there is interference by a no play zone for a ball anywhere except in a penalty area, see Rule 16.1f. Penalty for Playing Ball from a Wrong Place in Breach of Rule 17.1: General Penalty under Rule 14.7a. (1) Normal Relief Options. 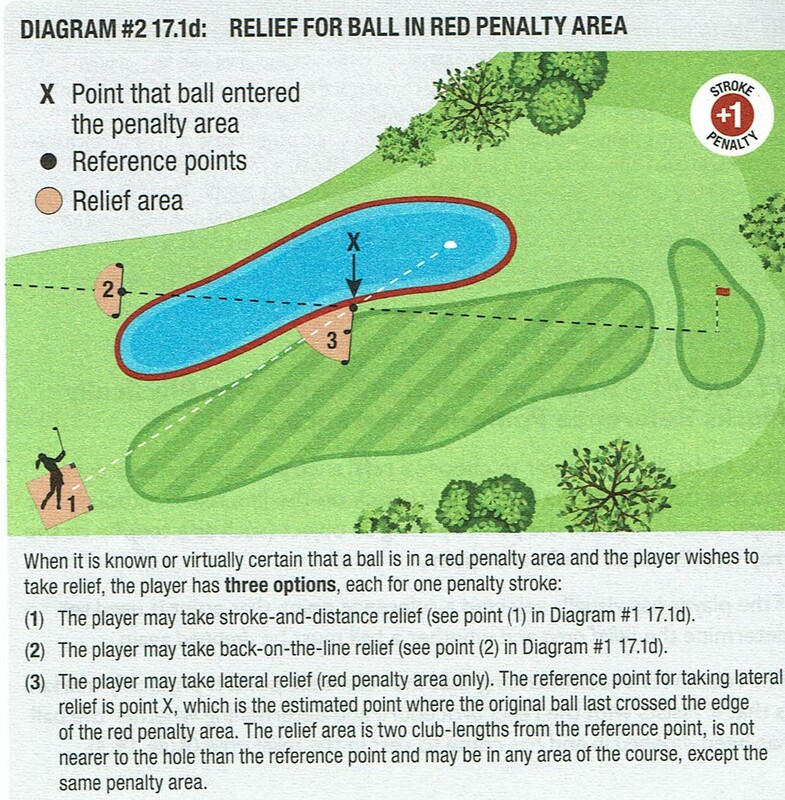 The player may take stroke-and-distance relief, back-on-the-line relief, or, for a red penalty area, lateral relief under Rule 17.1d(1, 2,or 3). 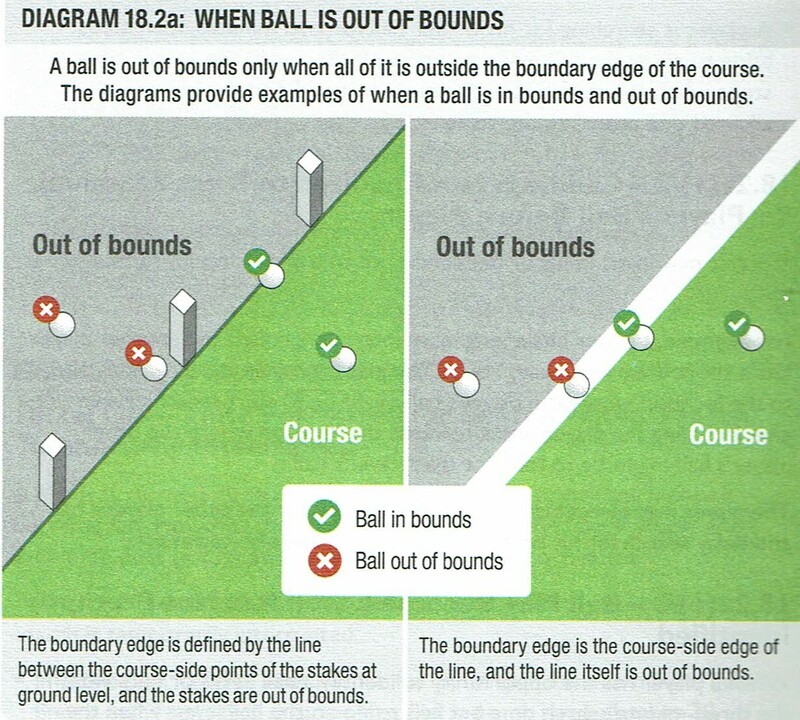 Under Rule 17.1d(2) or (3), the estimated point used to determine the relief area is where the original ball last crossed the edge of the penalty area where the ball now lies. • The player may take further relief outside the penalty area under Rule 17.1d(2) or (3) (for a red penalty area) or under Rule 17.2a(2). • If the player does so, he or she gets one more penalty stroke, for a total of two penalty strokes: one stroke for taking stroke-and-distance relief, and one stroke for taking relief outside the penalty area. (2) Extra Relief Option: Playing from Where Last Stroke Made Outside a Penalty Area. 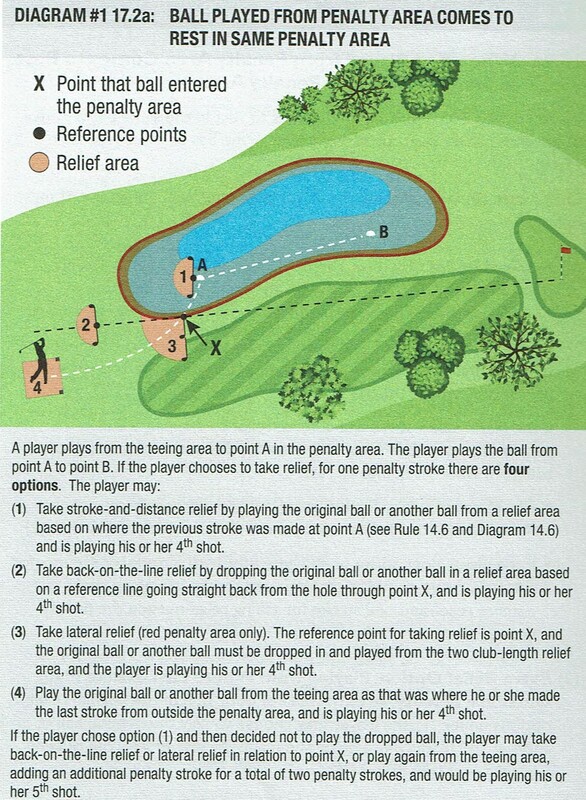 Instead of using one of the normal relief options under (1), the player may choose to play the original ball or another ball from where he or she made the last stroke from outside a penalty area (see Rule 14.6). • Unplayable outside the penalty area (see Rule 19.2a). • If the player does so, he gets one more penalty stroke, for a total of two penalty strokes: one stroke for taking stroke-and-distance relief, and one stroke for taking relief outside the penalty area. Penalty for Playing Ball from a Wrong Place in Breach of Rule 17.2: General Penalty under Rule 14.7a. • An unplayable ball (Rule 19). The player’s only relief option is to take penalty relief under Rule 17. But when a dangerous animal condition interferes with the play of a ball in a penalty area, the player may take either free relief in the penalty area or penalty relief outside the penalty area (see Rule 16.2b(2)). Rule 18 covers taking relief under penalty of stroke and distance. When a ball is lost outside a penalty area, or comes to rest out of bounds, the required progression of playing from the teeing area to the hole is broken; the player must resume that progression by playing again from where the previous stroke was made. This Rule also covers how and when a provisional ball may be played to save time when the ball in play might have gone out of bounds or be lost outside a penalty area. At any time, a player may take stroke-and-distance relief by adding one penalty stroke and playing the original ball, or another ball, from where the previous stroke was made (see Rule 14.6). • Even when a Rule requires the player to take relief in a certain way, or to play a ball from a certain place. • The original ball is no longer in play and must not be played. • This is true even if the original ball is then found on the course before the end of the three-minute search time (see Rule 6.3b). • Is playing a second ball in stroke play under Rule 14.7b or 20.1c(3). • The player must promptly attempt to identify the ball (see Rule 7.2) and is allowed a reasonable time to do so, even if that happens after the three-minute search time has ended. • This includes a reasonable time to get to the ball if the player is not where the ball is found. • Is above the boundary edge or any other part of the course. If a ball is lost or out of bounds, the player must take stroke-and-distance relief by adding one penalty stroke and playing the original ball, or another ball, from where the previous stroke was made (see Rule 14.6). • Was deliberately deflected or stopped by any person (see Rule 11.2c). • When a ball might be lost in a penalty area but also might be lost somewhere else on the course. • The player may play another provisional ball. • That provisional ball then has the same relationship to the first provisional ball as the first one has to the original ball. • It is not enough for the player only to say that he or she is playing another ball or is playing again. • The player must use the word “provisional” or otherwise clearly indicate that he or she is playing the ball provisionally under Rule 18.3. 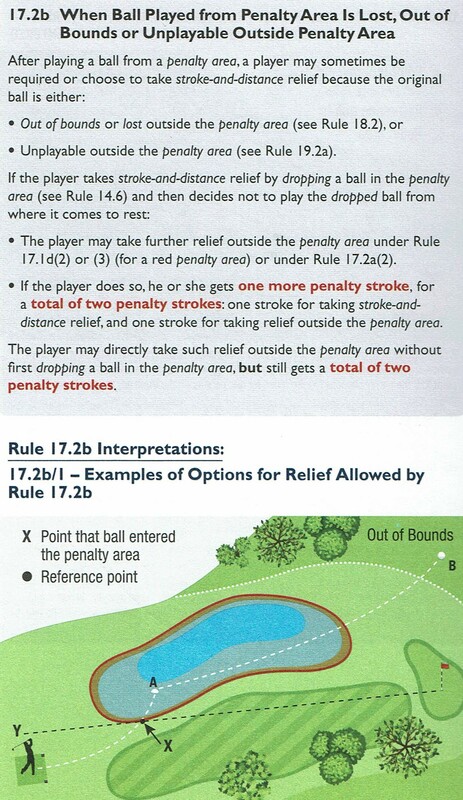 If the player does not announce this (even if he intended to play a provisional ball) and plays a ball from where the previous stroke was made, that ball is the player’s ball in play under penalty of stroke and distance (see Rule 18.1). (1) Playing Provisional Ball More Than Once. The player may continue to play the provisional ball, without it losing its status as a provisional ball, so long as it is played from a spot that is the same distance or farther from the hole than where the original ball is estimated to be. This is true even if the provisional ball is played several times. But it stops being a provisional ball when it becomes the ball in play under (2), or is abandoned under (3) and therefore becomes a wrong ball. • When Original Ball Is Lost Anywhere on Course Except in Penalty Area or Is Out of Bounds. The original ball is no longer in play (even if it is then found on the course after the end of the three-minute search time) and is now a wrong ball that must not be played (see Rule 6.3c). • When Provisional Ball Is Played from Spot Nearer Hole Than Where Original Ball Is Estimated to Be. The original ball is no longer in play (even if it is then found on the course before the end of the three-minute search time or is found nearer the hole than had been estimated) and is now a wrong ball that must not be played (see Rule 6.3c). • If only one of the balls is found on the course, that ball is treated as the provisional ball which is now in play. • If both balls are found on the course, the player must choose one of the balls to be treated as the provisional ball which is now in play, and the other ball is treated as lost and must not be played. • Treat the provisional ball as the ball in play under penalty of stroke and distance. • When Original Ball Is Found on Course Outside Penalty Area Before the End of the Three Minute Search Time. The player must play the original ball as it lies. • When Original Ball Is Found in Penalty Area or Is Known or Virtually Certain to Be in Penalty Area. 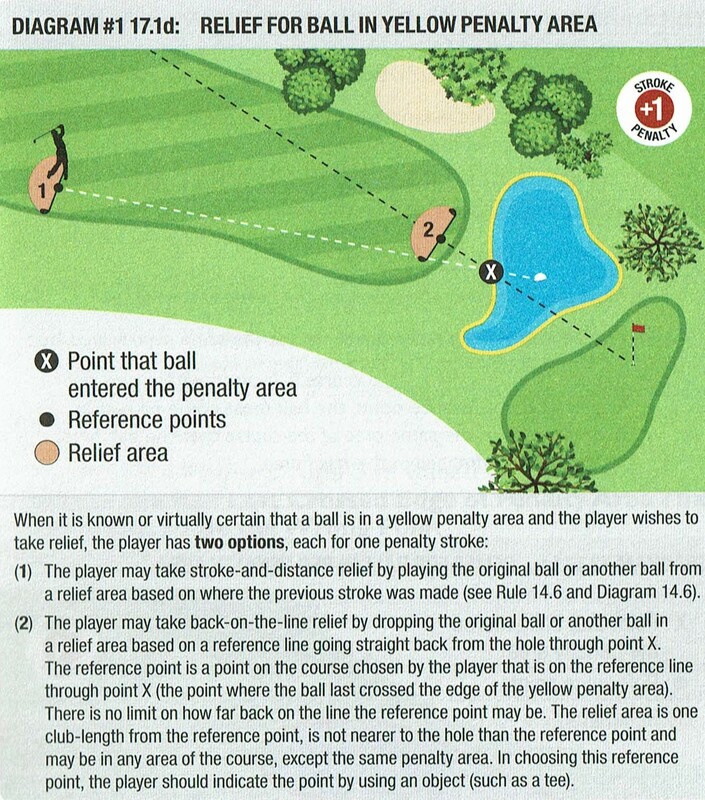 The player must either play the original ball as it lies or take penalty relief under Rule 17.1d. • All strokes with that provisional ball before it was abandoned (including strokes made and any penalty strokes solely from playing that ball) do not count. Rule 18L - RVSGT Local Rule Supplement This rule is being implemented for improved pace of play. Following a player's stroke, if his ball might be lost outside a penalty area, or be out of bounds, to save time the player may play another ball provisionally under penalty of stroke and distance under Rule 18.3 above: or, the player may proceed to search for his original ball. If his ball has not been found within the 3 minute search time, or when the ball is known or virtually certain to be out-of-bounds, the player must proceed under this local rule, and does not have the option of replaying the previous stroke under stroke and distance. 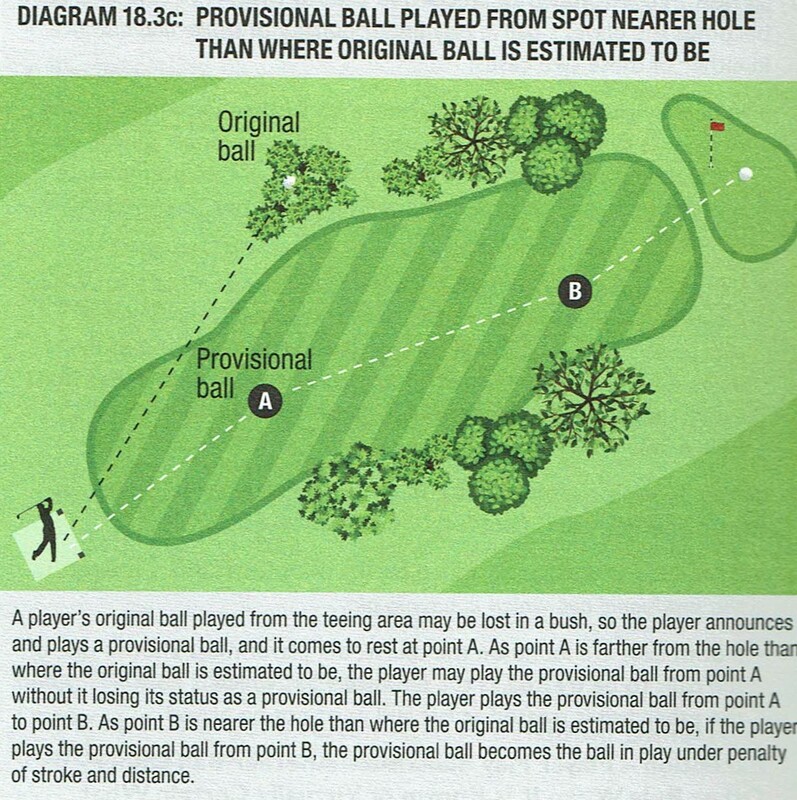 If the player proceeds with 18.3, and plays a provisional ball, this local rule is no longer an option, unless the provisional ball is also lost or out-of-bounds. The player must then proceed with this local rule for the provisional ball, or pick up for Triple Bogey Max on the hole in play. 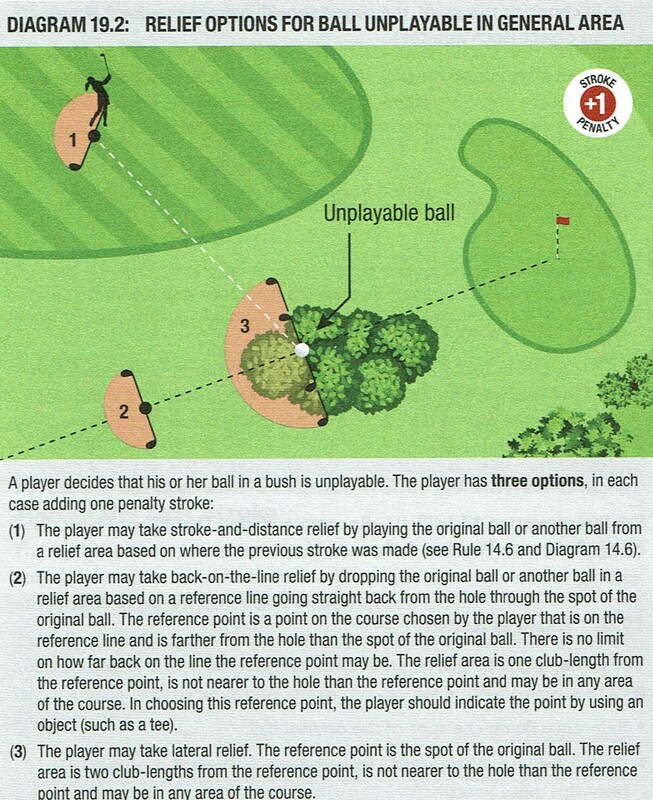 Rule 19 covers the player’s several relief options for an unplayable ball. This allows the player to choose which option to use – normally with one penalty stroke – to get out of a difficult situation anywhere on the course (except in a penalty area). 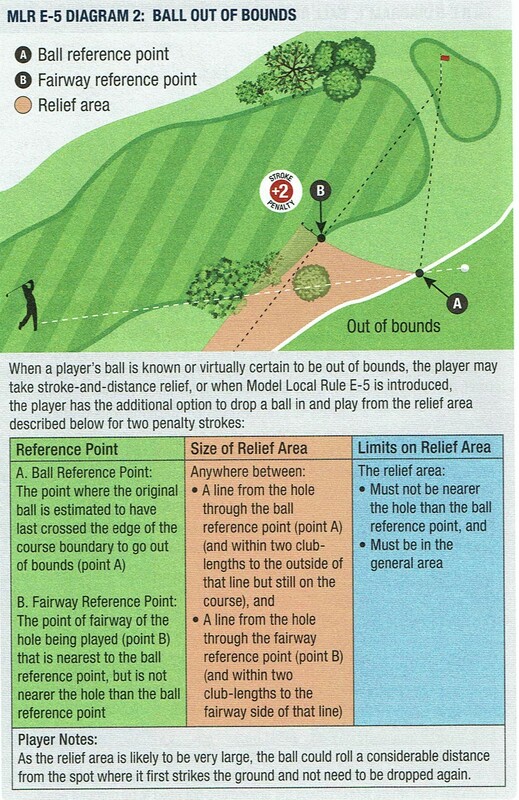 • Unplayable ball relief is allowed anywhere on the course, except in a penalty area. • If a ball is unplayable in a penalty area, the player’s only relief option is to take penalty relief under Rule 17. • The player may take stroke-and-distance relief under Rule 19.2a even if the original ball has not been found and identified. • But to take back-on-the-line relief under Rule 19.2b or lateral relief under Rule 19.2c, the player must know the spot of the original ball.  In choosing this point, the player should indicate the point by using an object (such as a tee). • Reference Point: The spot of the original ball.  If more than one area of the course is located within two club-lengths of the reference point, the ball must come to rest in the relief area in the same area of the course that the ball first touched when dropped in the relief area. 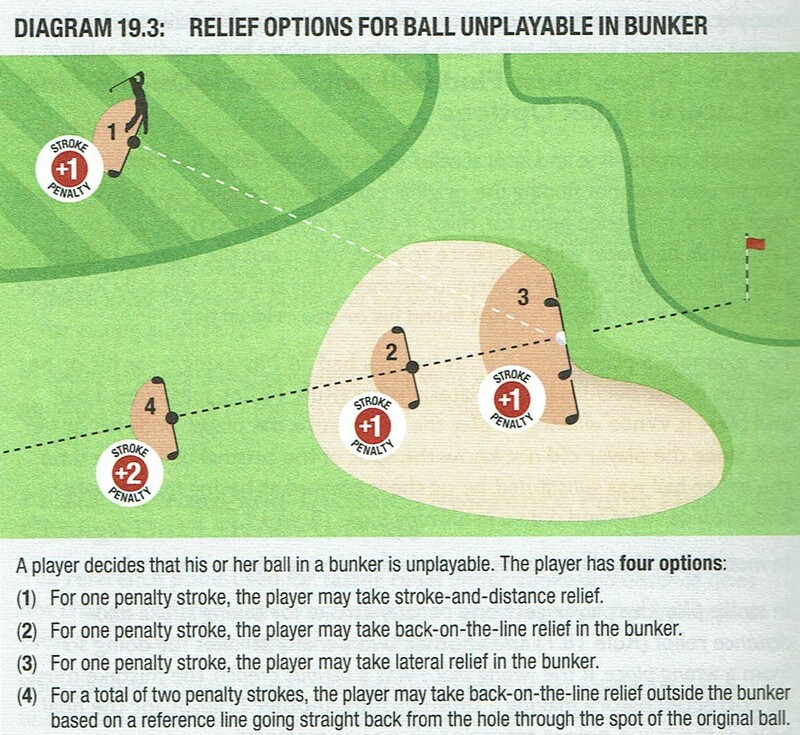 • The ball must be dropped in and come to rest in a relief area in the bunker if the player takes either back-on-the-line relief (see Rule 19.2b) or lateral relief (see Rule 19.2c).